North Beach is a popular tourist destination as well as a growing residential area, and soon it will be a little brighter. About 40 new LED streetlights will be installed along the beach walk and in two parks in the area. North Beach will soon be a little brighter. New streetlights are planned to illuminate portions of the northern half of North Beach, and specifically the areas of Dolphin Park, Beach Avenue, Surfside Park and Burleson Street. It's an estimated $148,000 investment, which will primarily be paid through parking meter revenue, said Darlene Gregory, chairwoman of the Parking Advisory Committee. Corpus Christi - Veronica Ramirez, 34, had her walking shoes on when she grabbed work gloves and a trash bag Saturday. She was ready to help make a change in one of the oldest neighborhoods in the city. After 20 minutes of walking down Leopard Street, her trash bag was full of paper cups, cigarette butts, empty water bottles, paper and plastic ware she found on the street and sidewalks. Ramirez was one of 60 volunteers who signed up for the fourth annual Thousand Hands Neighborhood Revitalization event and helped collect about three tons of trash. 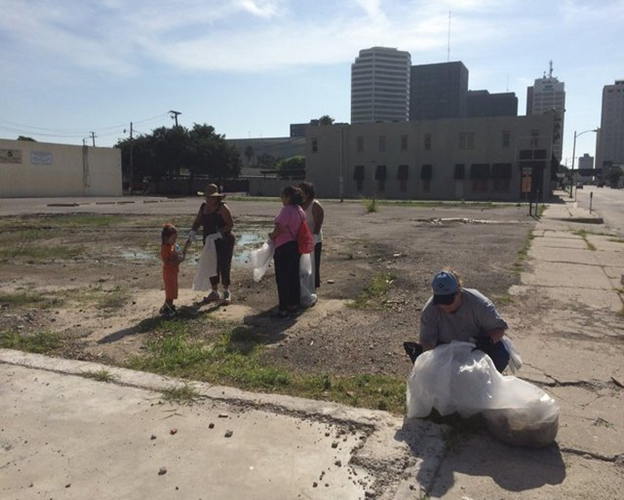 The event was the latest effort by the Uptown Neighborhood Initiative to clean up and revitalize the area including Tancahua Street and Port Avenue, and the corridors of Antelope, Leopard and Lipan streets. 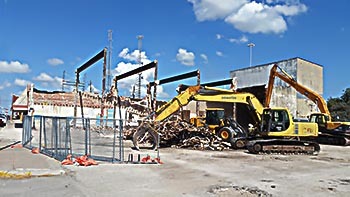 "It would be great for this part of town to go back to the way it was at one point," Ramirez said. "We need to give back to the community as much as we can," she said. RTA volunteer Daphney Rodriguez handed out water to those cleaning up Saturday. She said it would take the entire community to come together and help to have a successful Uptown neighborhood. "We go to other cities like, Austin and San Antonio, and we know there's so much potential down here to have a downtown like those cities," Rodriguez said. "The local gems, the restaurants and shops downtown are the ones we need in this area, that can give us what big chains can't and those local gems will get everything going down here," she said. Uptown Neighborhood Initiative chairwoman Darlene Gregory said this year she saw a lot more trash in the area but the organization will continue to work until the neighborhood is walkable and vital. Gregory said a plan is underway to employ better lighting in the area as well. "That lighting campaign will kickoff in the next couple of months, so we will relight Leopard, Peoples Street and the north end of North Beach in the first round," Gregory said. "If you light up the streets, people don't have a place to hide and commit crimes, " she said. The Uptown Neighborhood Initiative (UNI) is pleased to announce the Thousand Hands III Neighborhood Revitalization event, to be held on May 30, 2015 from 9am to 1pm. UNI expects a large turnout of volunteers for the next phase of its revitalization of the Uptown area; Tancahua Street to Port Avenue, along the Leopard, Antelope, and Lipan Street Corridors. 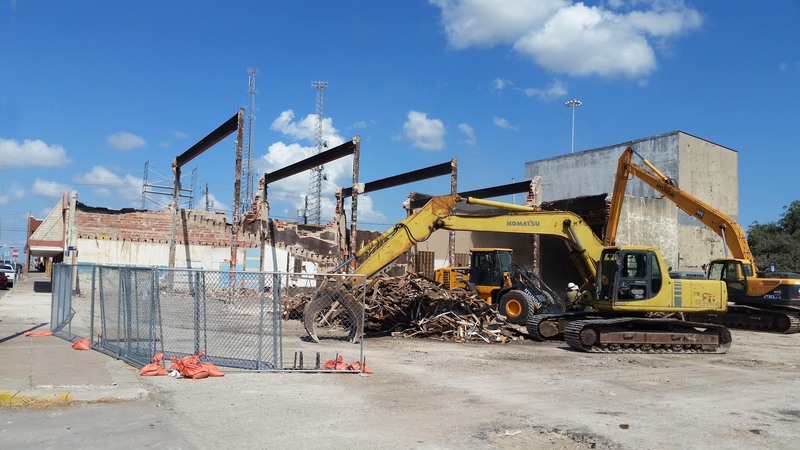 UNI plans to remove all trash from streets and lots, and mow and trim all overgrown lots and easements in the area with the assistance of City of Corpus Christi Code Enforcement and Solid Waste Departments, in 3 hours. Volunteers are asked to bring gardening or work gloves. Participants and team leaders will meet at 1024 Leopard Street, on the corner of Waco and Leopard, at 9am to receive their assignments. UNI will hold a block party with free refreshments and live music for volunteers immediately following the event. Uptown Neighborhood Initiative is a non-profit, grassroots group founded in December, 2009 by local business owners and community members to bring revitalization to Uptown Corpus Christi. During previous events, over 800 volunteers gathered 20 tons of trash from streets and empty lots. Power washing of sidewalks and mowing/trimming of 10 acres of lots was completed. 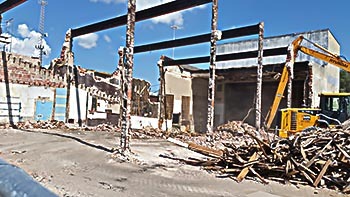 UNI has also demolished the former Cantu Funeral Home and the former Melba Theater, as well as 3 fire damaged structures in the district over the past 3 years. “We’re committed to revitalizing Uptown, largely through the efforts and private donations of our members, volunteers and supporters,” said Darlene Gregory, UNI Board of Directors Chairman. “We’re taking back our streets and improving the area,” she said, “our vision of creating a vibrant neighborhood is underway”. To volunteer or become a member of the UNI, please visit www.UNIcorpus.com or call 361-904-0044. Melba Theather has a demo date. Illuminating the darkened alcoves of Corpus Christi's downtown, uptown, North Beach and entertainment districts could be key in alleviating public safety concerns and drawing in more visitors and more investment. A grass roots nonprofit dedicated to revitalizing Corpus Christi’s uptown area recognized its partners at an awards luncheon Thursday, praising their efforts to help breathe life into the area within the past four years. The Uptown Neighbor­hood Initiative hosted the Good Neighbor Awards luncheon at a packed Corpus Christi Police Officers Association Hall, honoring nearly two dozen community partners, including government representatives and media and business leaders who have contributed services, volunteers, support and donations to renewing the uptown area. Notable projects high­lighted in the presentation included the demolition of the condemned Cantu Funeral Home in July and the Regional Transportation Authority’s plans for a $28.7 million Staples Street Center and Station. Those who came out represent “a huge and diverse group of people who are committed to making a difference — who may or may not know each other — but together, they can be the voice of Central City,” said Darlene Gregory, chair­woman of the nonprofit. The nonprofit, established in 2009, is composed of 174 members, including residents and business owners. Local businesses and government partners were honored Thursday by the Uptown Neighborhood Initiative at an awards luncheon, held at the Police Officers Association Hall. The Corpus Christi Regional Transportation Authority was honored as the good neighbor of the year for its dedication and commitment to the revitalization of uptown Corpus Christi. Kiii News also received a special award for being their media advocate of the year. The Affordable Care Act gives access to coverage to every person, despite any pre-existing conditions. Corpus Christians will have access to preventive services and screenings without paying anything out of pocket, to help them stay healthier by preventing health problems, or catching them before they become much more serious. In Nueces & San Patricio Counties, 39,450 citizens are eligible for subsidies. As we know, the current administration of the City is committed to offering citizens opportunities to improve their health through the Mayor’s Fitness Council. Offering a series of Town Hall or seminars to the public to educate our citizens on the health benefits offered by the Affordable Care Act is a public service, much like the other programs offered by the City that relate to health. Be Covered Texas, in association with Heavin & Associates, will offer expert information on the Affordable Care Act and assist individuals with enrollment in the plan of their choice through the State exchanges. Several other cities, municipalities and towns across Texas have offered this assistance to their citizens with excellent public relations results for the Administration. Healthier citizens who have health care insurance do not overburden the area’s emergency rooms, causing rising Hospital District taxation, which is a burden on every taxpayer. Since South Texas has such a high incidence of diabetes and heart disease, showing our citizens how to access preventative medicine will decrease the statistics and save lives. Also, we now have our Skip the Plastic petition for a single-use plastic bag fee posted online. If you haven't already signed the petition, please do so here: https://www.change.org/petitions/corpus-christi-plastic-bag-ordinance Thank you for helping to clean up Corpus Christi! U.S. Environmental Protection Agency (EPA) can conduct Environmental Site Assessments on property at no cost to the owners, purchasers or developers of property. This program, called the Brownfields Assessment Program, has been successful in man communities in redeveloping property and spurring economic development. Want to know more? Click the Images below to download the full PDF explaining all you need to know about the Brownfields Assessment Program! “Uptown Neighborhood Initiative……you and I can change our world”.